I am assuming you have your Raspberry Pi booted up and connected to your router and it has network and internet access. You will also need to be logged in. Make a note of your RPi’s IP address to use in a later step. Mine is 192.168.0.21. This will start SSH on your RPi. At this point, you are ready to SSH into your RPi from your Windows PC. Once you have installed PuTTY, run it. 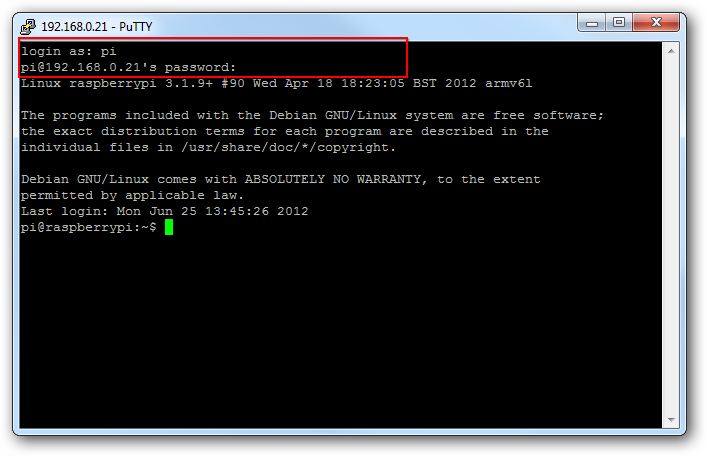 On the first page enter the IP address of your RPi in the Host Name box. This was found out in the first step above. Hit the Open button. A terminal Window should appear as below asking for you to login. Just enter your username and password and thats it. You now have a terminal window into your RPi.